Most of our city's urban areas, including parks and reserves, are in a controlled airspace. That is, airspace managed by Air Traffic Control because it's close to important flight paths. You need air traffic control clearance if you want to fly your drone in controlled airspace, unless you are flying a shielded operation. No matter where you fly your drone, you need to follow Civil Aviation rules. Find out how to fly a drone safely. 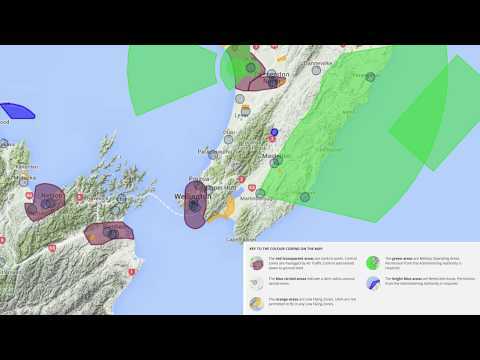 Airshare is the UAV hub for New Zealand. Go to the Airshare website to learn how to operate your drone safely, plan all your UAV flights, and request access to controlled airspace. In some of our parks, low level flying is allowed without getting clearance from air traffic control. To be a shielded operation, you must be flying your drone within 100m of an object like a building or a tree. You must also fly below the height of that object. However, you still have to log your flight plan. Some of our parks are outside controlled airspaces, so you don't need air traffic control clearance. Council permission is given to fly in these parks as long as you follow the general CAA rules, including logging your flight. You must also stay at least 25m away from boundaries, playgrounds and formed paths. Please take care around animals, particularly in areas where dogs are allowed off a leash. There are two categories of no fly zones in Palmerston North: prohibited and restricted. You need special permission from Council to fly a drone in these parks. Flying drones at parks in the airport take-off and approach paths is prohibited. However, the Council will consider requests for permission case by case. Before you apply to the Council, you need clearance from air traffic control or a shielded operation exemption. These are sensitive spaces. Casual flying is not permitted, though may be granted for special occasions or activities. The Palmerston North Rescue Helicopter operates above or close to these parks, without notice, on its rescue missions. Any UAV or drone flying in these parks must take extreme care to obey the CAA rules for flying shielded. All other parks are considered suitable for flying as long as you follow some general PNCC rules and comply with Civil Aviation Authority rules. You must also stay at least 25m away from boundaries, playgrounds and formed paths. Please take care around animals, particularly in areas where dogs are allowed off a leash.